The SoundEar 3 is the top of the Industrial range of noise warning signs, with advanced display configuration, measurement storage and outputs to integrate with other monitoring systems. This version of the SoundEar Industrial is ideal for carrying out long term noise checks but also giving an instant and clear warning of high noise levels. The SoundEar 3 Industrial is usually set up to let people know that the sound levels are getting high, with the red light coming on when action needs to be taken - either reduce the levels or use hearing protection. There are many ways to configure this version of the noise sign. Please visit the Displays page for more information. Each of the lights (green, yellow, red) can be configured to come on at different levels, and they can flash for better visibility. 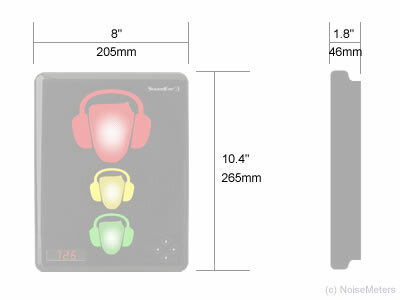 A common setting would be to have the green light on the time, to remind people that the sound levels are being monitored, the yellow light could be set to light up when the surrounding noise is 80dB(A) and the red light flashing when it exceeds 85dB(A). The SoundEar 3 Industrial has a plug-in microphone. It connects at the bottom of the sign and remains out of sight and out of harm's way. If you need to mount the microphone away from the sign then you can use a microphone extension cable, which should be ordered separately, order code SE3EXT. For larger areas the Extra Large SE3INDXL is available. With all the same display and logging features, the Extra Large version of the sign just adds visibility. The SoundEar 3 Industrial can output the sound level in two different forms, making it suitable for integration with other monitoring and control systems. Using the software supplied you can configure the outputs to be either DC 0 to 10V or current loop 4-20mA. Two outputs are available and can be set to different noise parameters. See the Outputs tab for more information. The SoundEar 3 Industrial is designed for high noise level warning and long term monitoring in industrial areas. Due to its attractive design, this noise sign is especially suited to areas where a typical "industrial" product won't fit in. Mounted on factory walls, the SoundEar 3 Industrial can warn workers that the noise levels are too high and that it is time to take action - reduce the noise levels or fit hearing protection. This instant alert of high noise levels is ideal for factories with intermittent noise levels. Rather than leaving employees to guess when to take action based on their own perception of the noise levels, it is better to clearly show the real acoustic situation. Taking advantage of the data logging facility and software (both included on the SoundEar 3 Industrial) you can check the noise levels throughout the day, identifying the noisiest periods. Installation of the SoundEar 3 Industrial consists of two parts: mounting it on the wall and setting up the display. The easiest way to mount the SoundEar 3 Industrial on the wall is using a single screw and hanging the sign, just like a picture. 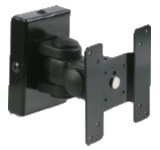 For a more permanent mounting, angled viewing and corner mounting you can use the optional VESA mount. 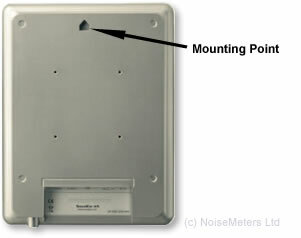 The mount is first fixed to the back of the SoundEar 3 Noise Sign and a VESA mounting bracket is fixed to the wall. The noise sign and mount are then fixed to the wall bracket. The SoundEar 3 Industrial comes complete with a plug-top power adapter. This provides the safe low voltage that the noise sign requires. The perfect location for a sign depends on the layout and the acoustics of the area in question. In large areas, or where the acoustic environment varies considerably, multiple signs should be used to ensure good coverage. A quick survey with a sound level meter (such as the one included in the multi-packs) can help determine the ideal locations. If the signs are being used to warn about a risk to hearing then it is not always just a simple case of setting it to 85dB(A). The sound level at the mounting point on the wall will be a little away from machinery and will probably suffer from reflections. Ideally it should be adjusted to light up when the noise levels where people are working approach the acceptable limit. 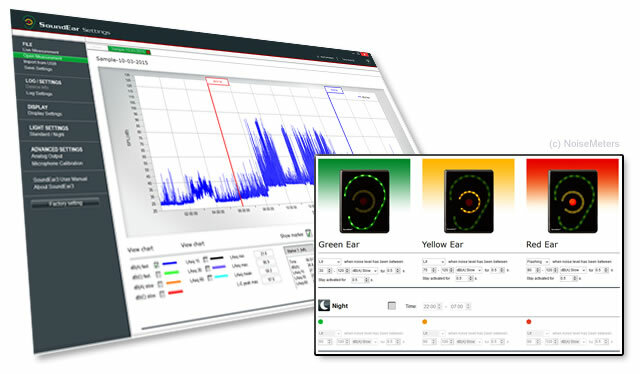 The SoundEar 3 Industrial can be configured in many ways, with different trigger levels for the green, yellow and red lights, as well as different trigger durations and minimum lighting periods. It can also be set to have different settings for night time and will switch to those at the set times. Green light - Usually used to indicate that the sign is monitoring, it can also be set to come on at a programmable sound level. Yellow light - Usually used to warn that the sound levels are getting close to the limit, also individually programmable to a sound level. Red light - Indicates that the noise is too high. This is also programmable with its own trigger level. No matter what the display is showing, the SoundEar 3 Industrial is still monitoring and logging the sound levels. It could even be left showing just the time or nothing at all, thus avoiding people shouting or whistling to see it react. If this is all you need to do then have a look at the SE3-320, which costs less and has just the small digital display. As each indicator (green, yellow, red) can be set to light up at different levels and can be set to be constant or to flash, there are many different configurations possible. Here are some examples. 2. High Impact Flash - For maximum impact when the threshold is passed, the sign remains dark and then flashes all three indicators at the same time. In this case all three start flashing at 85 dB(A). 3. Delayed Threshold - Waits until the level has exceeded the threshold for a period of time before lighting up. It can also be set to stay lit for a minimum period. The threshold for this example is 85 dB(A) for at least 3 seconds before it lights up all three colours. The software is included with the SoundEar 3 Industrial at no extra charge and is designed for all recent versions of Windows. It communicates with the sign via the computer's USB port. Downloads and configuration can be carried out via a memory stick, so you don't have to take the sign down from the wall each time. Measurements that have been stored in the noise warning sign can be downloaded to a computer for analysis and reporting. Although you can connect the sign directly to a computer's USB port, it is usually more convenient to download via a USB memory stick, as you don't have to take the sign down from the wall or take the computer to the sign. The SoundEar 3 will automatically transfer its measurements on to a memory stick that is plugged in. You then take the memory stick to a computer and load it into the SoundEar software. The image above shows the sound levels graphed over a 24 hour period. You can also view the live sound levels by connecting the SoundEar 3 Industrial to the computer's USB port and running the SoundEar software. The SoundEar 3 Industrial stores noise measurements in its internal memory. You can configure it to store a minimal amount of information for longer, or to store everything for a shorter period of time. The SoundEar 3 Industrial has multiple outputs that can be used to link it in to other monitoring and control systems. The software is used to configure the noise sign outputs to either DC level (0 to 10V) or Current Loop (4-20mA). It also sets the minimum and maximum sound level, in dB, that is mapped on to the DC or current loop output. For more information please visit the Outputs tab. If you have a Sound Level Calibrator and need to ensure the accurate operation of the SoundEar 3 Industrial then the software deals with this. Connect the noise sign to the software, connect a microphone extension cable and fit the calibrator to the microphone. The software Microphone Calibration option will then deal with the process of checking and adjusting. 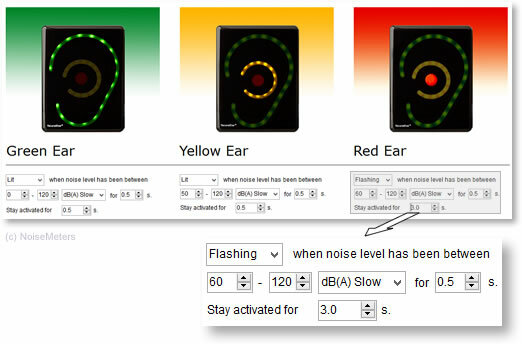 The software can be used to set the trigger levels and times for each of the green, yellow and red lights to come on. Much of this can be done using the keypad on the front of the sign, but it is much easier in the software. The SoundEar 3 Industrial comes with two powering options: USB (5V) or 24VDC. When using the current loop or DC output the unit must be powered by 24VDC, it will not work with the USB power option. For convenience, the 24VDC power connections are on the same connector as the current loop outputs and ground. The SoundEar 3 Industrial Noise Warning Sign includes standard 4-20mA Current Loop outputs. These provide a signal that does not degrade due to resistance, allowing for longer cable runs, limited by the ability to drive the current. The overall measurement range of the SoundEar 3 Industrial is 30dB to 120dB. You can process this whole range over the current loop or DC voltage output, or you can select the range of interest. The SE3IND-x Multi Packs include all these items for each SoundEar 3. They also include an NM102 Hand Held Sound Level Meter, which can be used for making quick measurements of sound levels in the surrounding area, and can be helpful when setting the signs up.